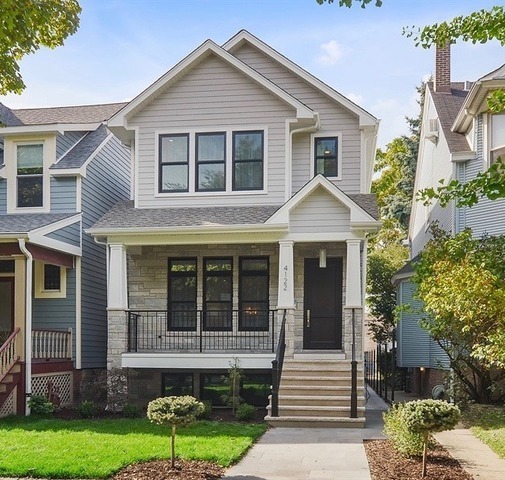 New construction, 5600 sf on a most desired SE Ravenswood street w $2M+ homes. Oversize 26.6x165 lot! This location can&apos;t be topped. Walk to brown line, metra, Zatterberg Play Lot Park (1blk away). Centrally located to great boutiques & restaurants in North Center, Lincoln Sq, & Southport Corridor. 4 generous BR&apos;s up, all ensuite, 800sf MasterSuite with vaulted ceiling, mbth steam shower, mbth heated floor. Kitchen w 10&apos; island, Wolf and SubZero appliances, opens to huge fam rm w walkout deck w fireplace & garage w roof deck. Heated porcelain tile LL floor w 2 generous ensuite BR&apos;s and 2nd fam rm w wet bar and wine refrigeration. SnowMelt heated front walkway and entry stairs. Half bath on main level and LL. Office/library on main level. Mud room off kitchen. 2nd floor laundry + laundry hookup in lower level. High end finishes throughout. Tons of storage!